Watson holds a share of the Bob Hope Classic lead despite a double bogey on the final hole when he found water. 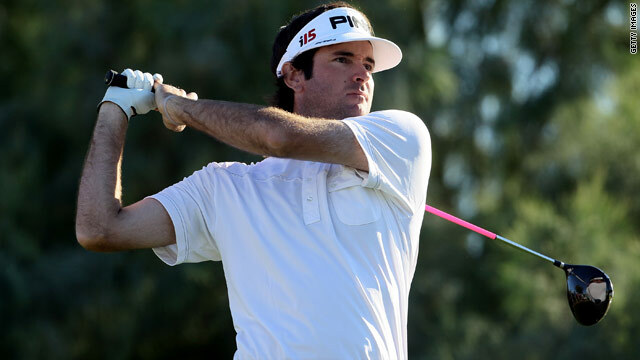 (CNN) -- Bubba Watson and Alex Prugh are tied for the lead after four rounds of the 90-hole Bob Hope Classic on Sunday, each missing chances to edge ahead going into Monday's final round. Watson double-bogeyed the final hole, hitting his second shot into the water en route to a three-under 69 to fall back into a tie with fellow-American Prugh on 23-under par 265. Tour rookie Prugh missed a three-footer as he bogeyed his own final hole to post a 70. Bill Haas and South African Tim Clark are a stroke back, both carding 66 for 266. Joe Ogilvie is two shots adrift on 267 after a 68 that included a costly double-bogey at his 17th hole. Watson, Prugh, Haas and Clark have never won on the US PGA Tour, and this event -- which features none of the tour's top 35 players this year -- appears to offer a great chance. Watson was poised to take a lead into the final round, which has been pushed back a day after rain washed out play on Thursday. Instead, his disappointing finish on the Nicklaus Private course -- one of four in use for the first four rounds of the event -- opened the door for Prugh. The cut claimed several of the tournament's bigger names, including England's Justin Rose, Justin Leonard, Rocco Mediate, David Duval, Sweden's Jesper Parnevik and Chad Campbell.